I’m generally not a guns person, “No weapons at preschool”. So in order to get this character down, I drew while playing ‘Red Dawn’ in the background. I hadn’t seen ‘Red Dawn’ in ages. I remember loving it- “Wolverines!”- but has anyone seen it in a while? It’s pretty messed up. It’s full vengeance and fear . Have I changed? Has society? Was the mindset of America that crazy during the cold war? The kids were told to stifle their grief and turn it into anger. So messed up. 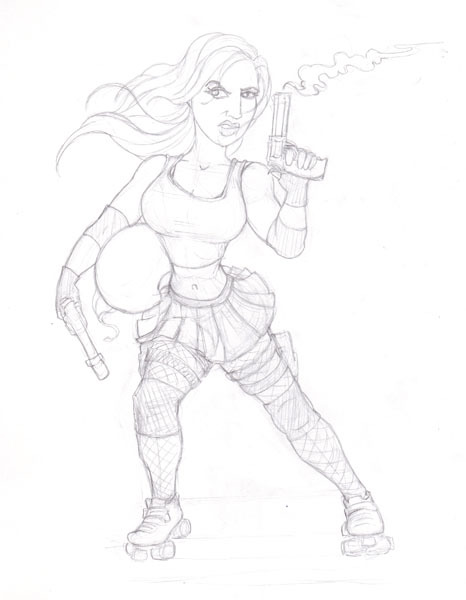 But ‘Red Dawn’ and stills from Tomb Raider helped me make this roller derby girl.